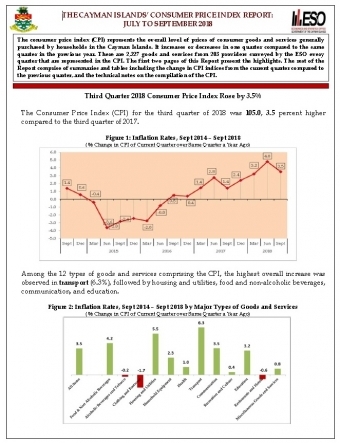 The inflation rate in the third quarter of 2018, as measured by the Consumer Price Index (CPI) for the quarter relative to the same period in 2017, is estimated at 3.5%, lower than the 4.8% inflation rate in the second quarter. The third quarter estimate brings the average inflation rate for the first three quarters of 2018 to 3.8%. In comparison, the average inflation rate for the same period in 2017 was 1.9%. The largest contributor to the third quarter inflation rate was transport-related items which went up by 6.3% on average. The cost of fuels continued to rise, this time by 10.7%. Airfares also rose by 8.0%, although this has significantly slowed compared to the increases of 21.5% in the first quarter and 52.3% in the second quarter. Electricity rates had a significant movement of 32.3%, which sustained the rising trend reported in the first two quarters of the year. The average increase for the first three quarters of the year is 23.3%. Meanwhile, the average housing rentals was stable during the quarter relative to the same period in 2017. More information from the Cayman Islands’ Consumer Price Index Report: September 2018 may be downloaded from www.eso.ky.